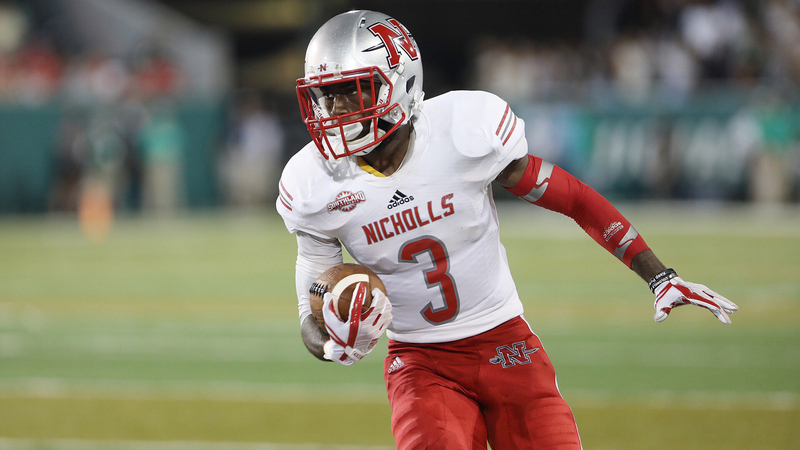 Nicholls wide receiver Damion Jean-Piere Jr. and the Colonels look to defeat McNeese for the second straight season (Photo: Misty Leigh McElroy/Nicholls Athletics). • After splitting games against FBS opponents to start the season, the Nicholls State University football team opens its 28th campaign in the Southland Conference against rival McNeese. Kickoff is Lake Charles on Saturday, Sept. 15 is scheduled for 6 p.m. The game will air on Cox Sports Television and is available online on ESPN3 to viewers outside of the CST territory. 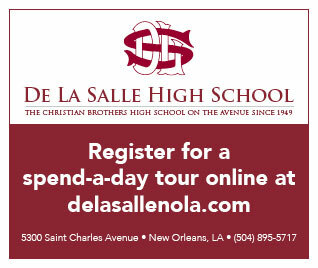 The radio broadcasts include ESPN Radio New Orleans 100.3 FM and KBZE 105.9 FM. • Nicholls will be looking to change its fortunes in Southland Conference openers as the Colonels have an 8-19 record in their first SLC game. After a heartbreaking 20-10 loss in head coach Tim Rebowe’s Southland debut at UIW in 2015, he has led Nicholls to wins in the last two openers. The Colonels and McNeese kicked off the season last year with a thriller, as Nicholls edged the Cowboys, 37-35, winning on a Lorran Fonseca 32-yard field goal as time expired. • Despite the win in last season’s matchup with McNeese, the Cowboys still hold a significant 30-12 advantage over the Colonels in the all-time series. Before last year, Nicholls had not defeated McNeese since 2008, dropping eight straight contests. The victory was only the fifth for the Red and Gray in the series since they joined the Southland Conference in 1991 (5-22). The best stretch for Nicholls against McNeese was from 1983-90 as the Colonels won six of the eight meetings. • Nicholls is coming off a home away from home game at Tulane as Colonel fans flooded Yulman Stadium to see the programs square off for the first time ever. Nicholls missed two early field goals and Tulane jumped out to a 21-3 advantage before Chase Fourcade threw his first touchdown pass of the season for a 21-10 deficit at the break. A Dontrell Taylor 32-yard touchdown run made it a 28-17 game in the fourth quarter before Tulane pulled away for a 42-17 victory. The announced attendance was 21,092 and nearly half the stadium was wearing red. • The Southland has been well represented this season in the Top 25 polls with four teams currently ranked. Nicholls slipped two spots in both polls – AFCA Coaches Poll and STATS FCS – falling to No. 12 and 13 after last week’s setback at Tulane. McNeese enters the matchup at No. 15/16 following a 2-0 start, and Sam Houston State leads the way with a 4/5 ranking. Central Arkansas is also in the Top 25 at 17/18, but the Colonels and Bears will not face each other in the regular season for the second straight year. 0 – The Colonels will be looking for their first win under head coach Tim Rebowe against a ranked team. Nicholls faced two ranked teams, Sam Houston State and South Dakota, last year and were defeated in both contests. McNeese finished the season in the Top 25, but were not ranked leading into the game. The last wins over ranked opponents were in 2008 where the Colonels defeated No. 12 McNeese and No. 11 Central Arkansas in back-to-back weeks. 7 – The Colonels have only 12 wins all-time against McNeese, and seven of the victories have come in Lake Charles. Nicholls has dropped the last four meetings in The Hole, with the last win being in 2008 as Nicholls edged the No. 12 Cowboys, 38-35. 351 – WR Damion Jeanpiere, Jr. has 351 career receiving yards against McNeese to go along with three touchdown catches. Averaging 29.2 yards per catch against the Cowboys, Jeanpiere has racked up 112 (5 rec. ), 94 (4) and 145 (3) in his three outings. He also had four catches over 50 yards, including TD grabs of 62 and 77 last season. • McNeese started the season with two road victories, winning at Northern Colorado (17-14) and HBU (51-34). After earning a preseason ranking of No. 17 in the coaches poll and 18 in the STATS FCS, the Cowboys enter the matchup at 15/16. • Both teams feature all six Southland Players of the Week so far this season. Nicholls swept the honors in Week 1, and McNeese did the same for Week 2. QB James Tabary torched HBU’s defense for 355 yards and 4 TDs, with all but 26 yards coming in the first half. DB Darion Dunn picked off two passes, and PR Parker Orgeron had a 59-yard punt return for a touchdown. • Head coach Lance Guidry is in his third year at the helm at McNeese, posting a 17-7 overall record. He led the Cowboys to a 9-2 record last year in his second campaign. Guidry served as the defensive coordinator from 2013-15 before taking over for Matt Viator, who left for the head coaching position at ULM. • Defense has been a staple of McNeese’s program, and it has been no different in 2018. The Cowboys have 10 sacks, ranking second in the nation, and lead the Southland in scoring defense (24.0 ppg), rushing defense (92.5 ypg) and turnovers forced (7). … give Nicholls its first win over a ranked opponent since 2008. … put the Colonels at 1-0 in league play for the third consecutive season. … improve Coach Rebowe’s overall record to 18-19. He started his career 0-5. … be the Colonels’ 13th victory in the all-time series. … improve Coach Rebowe’s record vs. Louisiana schools to 5-7 (5-5 vs. FCS). … be the eighth win over the Cowboys in Lake Charles and first since 2008. … give Nicholls consecutive wins over McNeese for the first time since a four-game streak from 1985-88. • Nicholls is 2-4 on Sept. 15, with only one win on the road. The lone matchup against McNeese was in ’84, with the Cowboys taking a 24-21 victory in Thibodaux. Nicholls has never played a Southland Conference game on this date. – Dixon had a career-high 112 receiving yards on 4 rec. With 14 league titles, McNeese has been the premier program of the Southland Conference over the years. Nicholls has just 12 wins all-time against the Cowboys and in the four years that Nicholls has made the playoffs, the Colonels defeated McNeese. Last season, Nicholls edged McNeese on a last-second field goal in the opener and went on to host a playoff game for the first time ever. The Colonels also defeated McNeese in 1986, ’96, and in their championship season, 2005. Coach Rebowe was on the staff as an assistant in ’96 and the season-ending victory not only secured a spot in the playoffs for the Colonels, but capped an impressive turnaround with Nicholls going 8-3 in the regular season after posting an 0-11 record in ’95. Despite opening the season against FBS programs, the Colonels rank No. 9 in the FCS with 9.0 sacks after two games. Nicholls had 6.0 sacks in the opener at Kansas, its most since 2009, and followed up with 3.0 at Tulane.Evan Veron has led the way with 3.0 and ranks 6th in the nation, while Sully Laiche has 2.5 and is 14th. Joining the party so far this season have been Laryon James (1.5), Kenny Dotson (1.0), and Kevin Johnson (1.0). After starting the season with three road games, Nicholls makes its home debut Saturday, Sept. 22 against No. 5/4 Sam Houston State. Kickoff is scheduled for 3 p.m. and the game will stream live on ESPN+. For the latest news and in-game updates, be sure to follow the team on Twitter @Nicholls_FB.